The 30th Annual Chicago Commercial Real Estate Awards (CREA) Dinner held on March 15 brought together nearly 2,000 of Chicago’s top architects, brokers, developers, property managers, interior contractors and design professionals to both celebrate the outstanding achievements in all facets of the industry and to support the Greater Chicago Food Depository (GCFD). Thanks to the generosity of attendees and sponsors, the CREA raised a record $1.45 million to fight hunger and its root causes in Chicago and Cook County. Associated Bank has been a proud supporter of the event for over 15 years and a proud presenting sponsor for eight years. As part of the event, Associated Bank also sponsors the Legend Award recognizing an individual for their significant contributions and legacy in the real estate community. This year’s award was presented to Goldie B. Wolfe Miller of The Goldie Initiative, a program designed to educate, encourage and promote women in Chicago’s real estate industry. This is accomplished through providing scholarship support for graduate study, mentorship and networking opportunities to women with high potential who are committed to becoming the leaders in the industry. 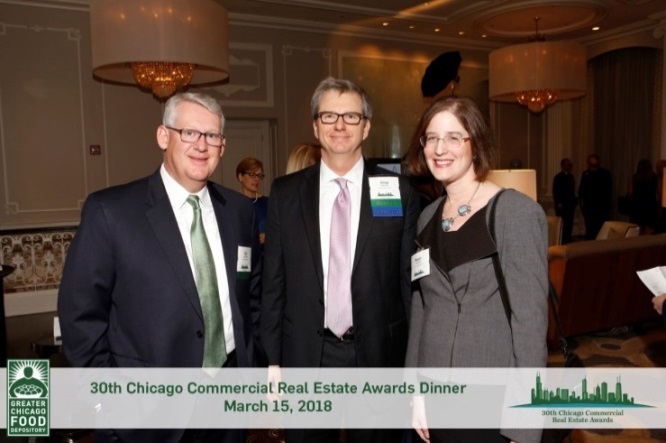 Greg Warsek, senior regional manager, Commercial Real Estate (CRE), Associated Bank, additionally supports the event as a member of the CREA Event Steering Committee for the past eight years. He also serves on the Blue Ribbon Panel of CRE professionals that select the finalists from the various submissions. Warsek’s CRE team and 40 of his internal partners from Credit, Finance, Human Resources and Capital Markets volunteer numerous times throughout the year by packing food at the food depository facility. Find more information on the event and view photos from this year’s event here.